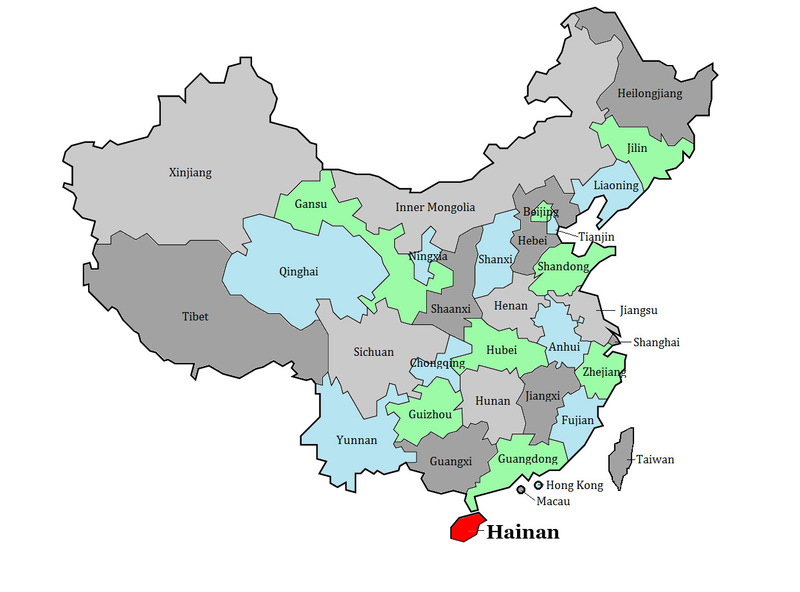 Hainan is China’s smallest and southernmost province. Slightly bigger than Belgium, the province has an area of 33,920 square kilometers, and is made up of two hundred islands scattered among three archipelagos off China’s southern coast. At 32,900 square kilometers, Hainan Island comprises 97% of Hainan Province’s land mass. Hainan is situated in the South China Sea, separated from Guangdong’s Leizhou Peninsula to the north by the thin Qiongzhou or Hainan Strait. The west coast of Hainan Island is about 320 km east of Vietnam, across the Gulf of Tonkin. Haikou is Hainan Island’s capital. 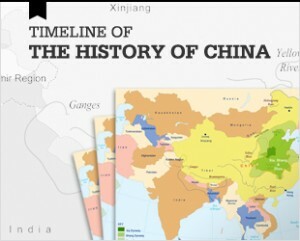 Historically, Hainan was part of Guangdong province, but became a separate province in 1988. China asserts that Hainan’s territory includes the Spratly Islands, the Paracel Islands, and other disputed marine territory. China’s assertions are contested by Brunei, Malaysia, the Philippines, Taiwan and Vietnam in the case of the former, and Taiwan and Vietnam in the case of the latter. There is no definitive international recognition of sovereignty for either archipelago. During the 1920s and 30s, Hainan was an important base for the Communists after the 1927 Shanghai Massacre drove the Communists into hiding. During the Second Sino-Japanese War, Hainan fell under Japanese occupation. To aid its war effort, Japan built roads and railway lines in order to facilitate the mining and transportation of the island’s iron ore, bauxite and tin. The Japanese also increased the island’s rubber production. The Communists and the Li natives resisted Japanese occupation, but in reprisal, the Japanese slaughtered over a third of Hainan’s men. The Chinese Nationalists re-took Hainan after WWII. Hainan was then one of the last areas places to be seized by the Communists at the end of the Chinese Civil War. 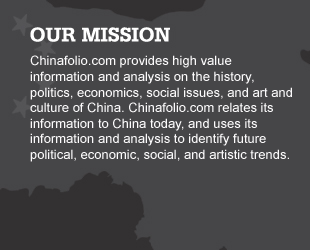 Once in control of Hainan, Communist China was reticent to invest in the area due to its strategic vulnerability. It wasn’t until 1988, when the island was designated a Special Economic Zone to facilitate foreign investment that Hainan’s economic growth began to accelerate. Hainan has a population of 9 million people. 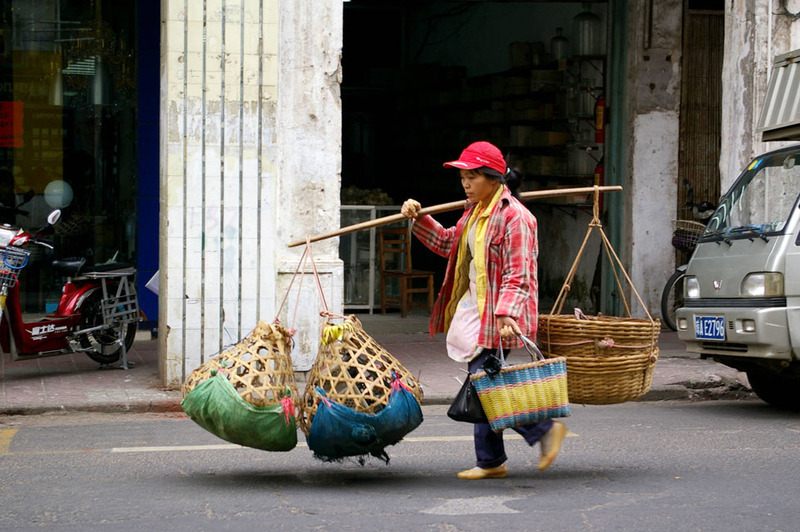 A little over 83% of the Hainan’s residents are Han, often called Hainanese. The Li account for about 15% of the population and the Miao and the Zhuang account for about 1%. Some Hui also make their home on the island. Despite recent rapid urbanization, the population remains largely rural. 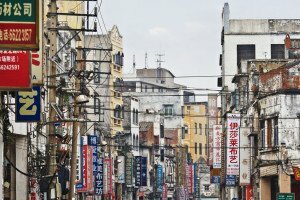 About a quarter of Hainan residents live in Haikou. Hainan residents speak Hainanese, Mandarin and Cantonese. Hainan’s designation as a Special Economic Zone in 1988 has acted as a stimulus to speed up the diversification of Hainan’s economy away from agriculture. Prior to the creation of the zone, Hainan’s industrial development consisted primarily of food processing and mining, with some machinery, farm equipment and textiles manufacturing. Hainan has reserves of a large number of minerals including iron, titanium, manganese, tungsten, bauxite, molybdenum, cobalt, copper, gold, and silver. Since the Special Economic Zone’s establishment, these industries have now expanded. Hainan is now also engaged in offshore petroleum and natural gas exploitation, petrochemical manufacturing, automobile production, papermaking and metallurgy. Hainan has identified significant deposits of lignite and oil shale on the island as well as oil and natural gas in the waters off its shores. 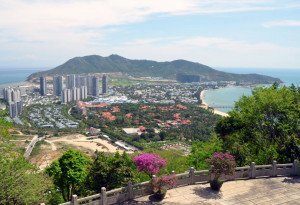 Hainan is also actively developing its tourism industry on the basis of its forested mountains and sandy beaches. 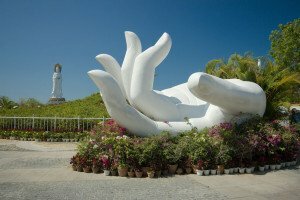 Since the 1990s, new hotels, restaurants and other tourist facilities such as golf courses have been created, spurring Hainan’s construction and real estate industries. Hainan is also expanding its duty-free shopping the aim of growing luxury goods and other retail sales. 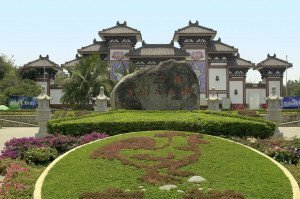 Beijing has also announced plans to invest an estimated $16 billion in Hainan’s medical tourism industry by establishing China’s first special zone for medical tourism – the 20 square km Boao Lecheng International Medical Travel Zone – situated near Qionghai city and Boao town. The Zone’s south area will focus on health care centers for the elderly and for patients with chronic disease while the north will concentrate on medical treatment and research, such as stem cell research. The Zone will make use of both traditional Chinese and western medicines, encourage the establishment of overseas medical institutions, and provide preferential policies for the import of medical instruments and medicines. The Wanning River flows through Hainan’s south while the Nandu River and its tributary the Xinwu River flow though the island’s north. The Changhua and Wanquan Rivers run through the west and east of the island respectively. Evaporation during the dry season significantly reduces the rivers’ flow and their hydro-capacity, challenging the energy grid. 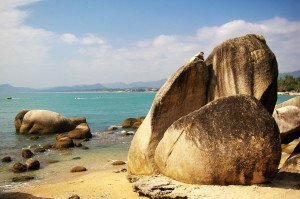 Hainan’s 1500 km long coastline benefits from many sandy beaches, numerous bays and natural harbors. Hainan’s climate is tropical and monsoonal. Tropical storms and typhoons frequently batter the island, especially in late summer and early fall. The uneven distribution of rainfall both seasonally and geographically has meant that parts of Hainan have been hit by drought on my occasions. Close to Haikou is the 108 sq km Haikou Volcanic Cluster Park featuring extinct volcanoes, lava tunnels, the 20m by 15m Huoshan Dong Volcanic Cave, and the abandoned Huoshan Cun Volcanic village constructed from lava stones. Further afield is the Dongjiao Coconut Plantation area in which traditional farming villages nestle between groves of palm trees that reach down to long stretches of sandy beaches. Just north of the plantation is the Tonggu Ling Mountain Nature Reserve providing great views of the coast, particularly well-known Yue Liang Wan beach. Boao, on Hainan’s east coast sits at the confluence of three rivers, but is most known for hosting the Boao Forum for Asia, an annual conference for officials, academics and economists specializing in Asia. Boao is set in beautiful countryside near good beaches. 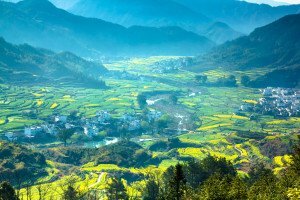 Nearby are the quaint farming villages of Da Lu Po and Nanqiang and, on the coast, the fishing village of Tanmen. Close by is the Cai Family Former Residence – now a heritage site – built in 1934 by brothers who made their money in Indonesian rubber. Also on the east coast, south of the Shimei and Sun and Moon Bays is the traditional fishing port of Xincun, where painted fishing boats are set against a backdrop of turquoise sea and green hills. Many of its residents reside on houseboats tucked amongst the fishing fleet. China’s longest gondola links the fishing village to Nanwan Monkey Islet where hundreds of macaque monkeys make their home.South of Boao is Shimei Bay and Sun and Moon Bay which is home to both beautiful beaches and Hainan’s budding surfing scene. In the island’s central highlands, the majority of the Li and Miao people reside. Wuzhishan City, also called Tongshi, is named after is nearby mountain, which makes for good, although sticky climbing as the area receives the highest rainfall in Hainan, and often has a humidity rate hovering close to 90%. 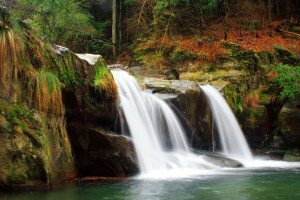 The mountain is set in a forested reserve which is the source of the Wanquan and Changhua rivers. Mist often covers its peak. Also a good climb is the Qixian Ling or Seven Fairy Mountain, resting about 39 km southeast of Wuzhishan. The mountain is located in the National Hot Springs and Forest Park, not far from the Li town of Baoting.